Discussion in 'iPad Apps' started by Ric Clarke, Jun 21, 2011. Hi, I have way too many apps on my ipad and iphone and they are totally unorganized. I was thinking that I would take screen shots of each screen and copy them into a Word document (or Excel, because I know that better) and cut each of the app icons and then paste them into new pages (including folders). When I get them into the groups that I want, I would then copy that layout to the actual ipad & iphone. Then I thought that it would be great if there was a program that could do that. Does anyone know of such a program? or is there anyone that would write one? It would be great if the program also allowed notes to be added to the apps on the computer that would allow the user to write short notes . . maybe to remind them of why they downloaded the app in the first place. This is what I did with my iPad. Press and hold the icons till they shake and the drag two apps together and they create a folder that you can name. When I first acquired the iPad, a year ago, the best thing that happened last year was the advent of OS4, this version introduced the ability to group similar function apps into one folder. I have taken this function and started putting apps together. For instance, all news oriented apps went into that folder. I have a lot of photo processing apps and photo management apps, so I put all of those photography related apps together. All notes apps found themselves together. I have all my reference apps, like Wikipedia, into one folder. I even have a Reject folder-->this folder contains all the apps that I found to be virtually useless...they looked good in the appstore but upon acquisition found to be lacking. I have this reject folder in a second screen. Apps are so personal to me that I didn't like how the iPad categorized some of the apps, so those folders had their own personalized folder name--which you can do by editing the app folder. I'm replying back to you based on my own experience. 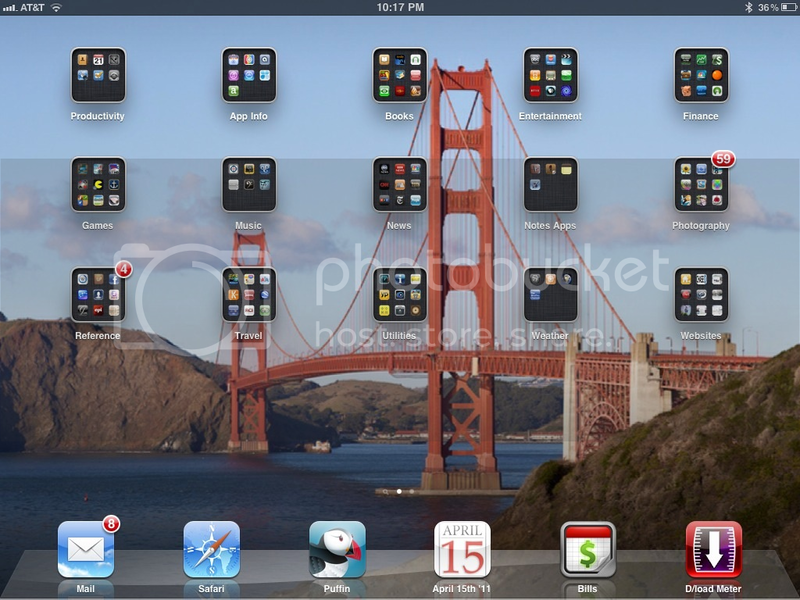 I haven't seen app that manages apps into folders and screens. Perhaps another forum member can comment? Although I use a couple of folders, it never occurred to me to use all folders. I think I'll try that. It should be easier to keep them organized that way. Is ther a way to get more than nine app icons into a group icon? The limit is actually 20. Please tell me what is this organizer called? It's called hold down an app icon until it wiggles and drag apps on top of one another to create folders. And you can edit the group name.